When I visit my mother, she and I usually spend time in her apartment looking at the photos and narrative of my blog, daughter-in-law Katie’s blog, The Daily Skup, and Facebook posts by her other grandchildren. Although Mother has no interest in using a computer on her own, with me doing the navigating, she enjoys the glimpses that blogs and Facebook give her into the lives of her loved ones. During our most recent visit, however, maintenance work in her apartment sent us out to a sofa in a second-floor common area. We snuggled up with the computer positioned in our laps where we could both see. I finished reading a recent “Forebears and Four Bears” post to her. She said with some urgency to go back for another look at the photo of the quilted bears. She was excited that she recognized several quilt pieces on one of the bears. The pieces were scraps from material her mother had used to make dresses for Mother and her sisters more than three quarters of a century ago. Those bears had been in her home for a number of years, but it took a photo on a blog for that memory of her younger years to surface. 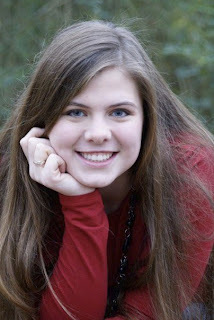 By the time we had finished looking at granddaughter Molly Kate’s newest adventures on The Daily Skup, we discovered another bonus from our blog visits. Mother had to leave her sofa behind when she moved to her new living space. Since her move we had missed sitting close together on the sofa -- a cup of coffee for her, tea for me, and quiet conversation. After our computer session outside her apartment, the light bulb finally blinked on over both our heads. We realized we could renew that long-standing mother-daughter tradition. It will just be a different sofa in a different place, and we will be transporting our cups a bit farther than before her move. 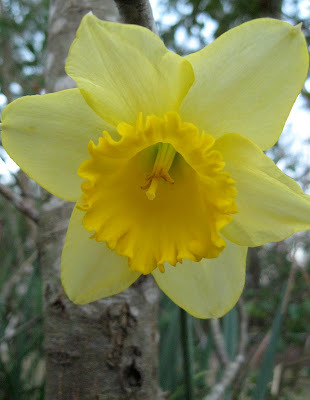 Recovered memories and renewed habits of the heart – blogging lagniappe indeed. I have a problem with the Smart Car. The first time I saw one, I stood on a busy street corner entranced. Blue with a white stripe, the car looked like a stubby athletic shoe on wheels. Within moments more of the brightly colored athletic shoes zipped in and out of the heavy traffic in front of me. My problem is that I cannot remember where that memorable encounter occurred. My best guess is Rome during a three-city trip to Italy in 2006. Husband Walter thinks Florence. But we could both be wrong. Unfortunately we couldn’t locate any photos from those trips that jogged our memory. We saw the little red number pictured above two days ago in a parking lot near a favorite coffee shop in our hometown. Several days earlier another red one was parked at the front entry of the retirement community where my mother resides in Hattiesburg. I asked the owner if he was happy with it. I can remember when sightings of a Volkswagen beetle were unusual in my hometown, probably around 1959 or 1960. One of my many cousins was a high-school cheerleader and five years my senior. I was so impressed when she added ownership of a VW beetle to her list of characteristics that I admired. I find myself extending that same admiration to the unknown (to me) owners of the occasional Smart Cars that I spot, probably because my own comfort zone is a van high above the street and useful for camping. The novelty factor of Smart Cars may fade for me, but right now they make me smile. 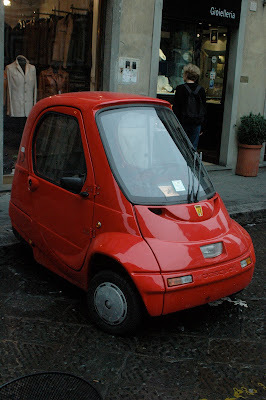 Update: Husband Walter just found the car photo below that he took in Florence. 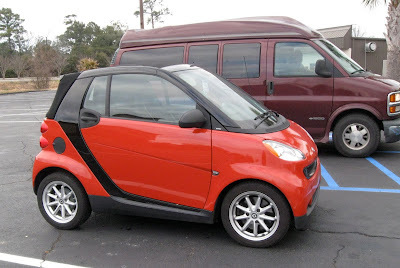 It is not a Smart Car; it is even smaller. The best I can tell from the photo is that it is a Pasquall. My brief Google attempt was not enlightening. 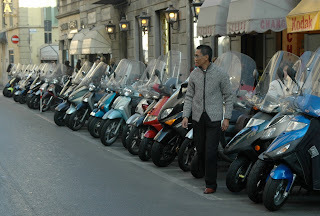 I can't tell which is bigger, the mini-car or the popular motorcycles and scooters. 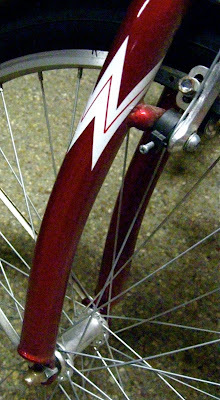 I like Walter's photo below. These few pieces of chocolate are all that remain of two festive party favor bags from two-year-old granddaughter Molly Kate’s Minnie Mouse birthday party Saturday. The “thank you” message from Molly Kate on the bags was among a multitude of happy little touches that daughter-in-law Katie does so well. Technically one bag was for me and one for husband Walter. But I confess: I am guilty of indulging from both. My resistance to temptation -- and ability to share -- diminishes embarrassingly when chocolate or salty snacks are in our house. Walter and I also feasted the day after the party on scrumptious leftover pastalaya – think jambalaya with spaghetti instead of rice. It was my first encounter with pastalaya but definitely won’t be my last. Katie’s brother Patrick was the chef and supplied enough of the tasty Louisiana dish for the 32 adults to enjoy at Molly Kate’s party and to take home well filled go boxes. We were still celebrating Sunday night. Yum! A trip to Prairieville, LA, today was a joyful celebration of the two-year anniversary of granddaughter Molly Kate’s entrance into the world. 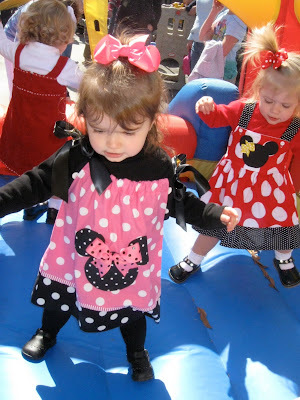 Molly Kate loves a party, and she was a mix of action and awe at her Minnie Mouse party. Birthday girl Molly Kate, left, and her cousin Clara go all out in the jumper. This little girl went non-stop -- climbing, jumping, engaging great-grandparents and grandparents in her antics with balloons, blowing bubbles, chasing treats from the Minnie Mouse piñata. She was entranced by her birthday cake and was vocally enthusiastic about the crepe paper decorations her dad had draped around the ceiling fan. 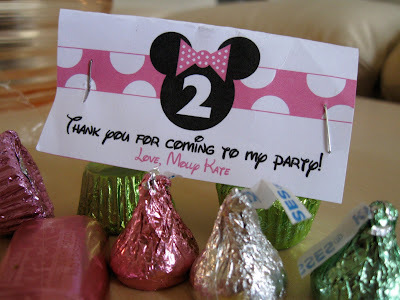 The plaited crepe paper was pink and black, Minnie Mouse colors, of course. 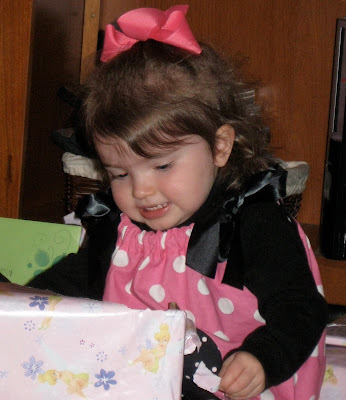 The Minnie Mouse theme was her choice, and mama Katie had carried it out thoroughly. Molly Kate focuses her considerable concentration on the serious business of opening gifts. As guests were departing, Molly Kate was still going and going, although more slowly, relishing final moments with other little ones. Many of the adults, including husband Walter and me, had been at the hospital two years ago, waiting for Molly Kate’s arrival. It has been a blessing, watching her grow from infant to a special little girl. 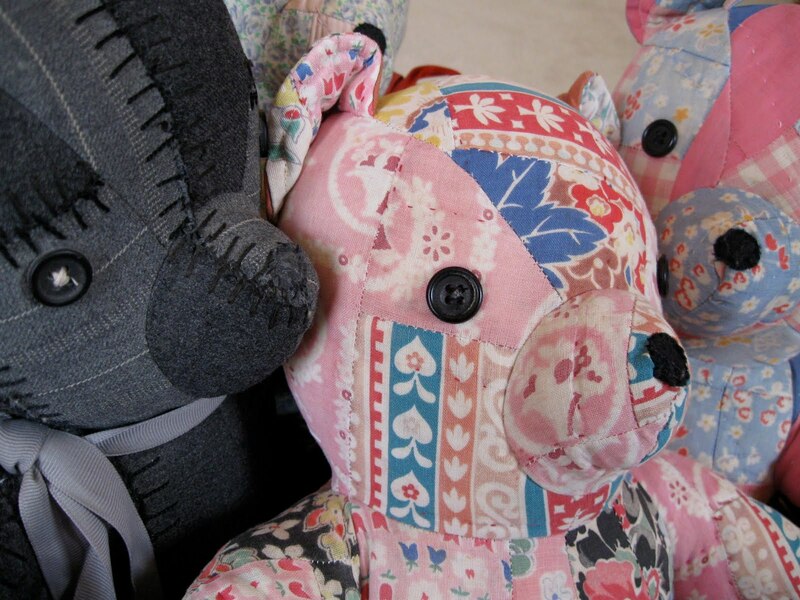 Recycling quilts into these bears has helped preserve family history. After a six-month hiatus to focus on my mother’s medical challenges, I am back to dealing with boxes of memories. April 1, 2009, she downsized from a four-bedroom home to a studio apartment in a retirement community. Since then my husband and I have packed our modest home with family photos, mementos and various items from her house that either she or I just could not let go. I was making progress sorting, organizing and sometimes eliminating until Mother encountered health issues. She is doing better, but our new normal is that her involvement with medical providers may continue to occupy chunks of her life and mine. That said, waiting until things “settle down” is not an option for dealing with the numerous remaining boxes and bags that I stacked in corners and tucked in various nooks and crannies. Yesterday I began a new strategy, devoting just 15 minutes a day to unloading boxes and making decisions. Obviously not much is accomplished, but 15 minutes is better than doing nothing. And I expect that those few minutes will eventually get the job done. Anyway, yesterday’s quarter hour unearthed photo albums my late father had filled during his semesters at Jones County Junior College in Ellisville, MS, in the 1930s. I spent most of my 15 minutes looking at youthful images of my father, my mother, their siblings and friends from the days before my mom and dad wed. How had I missed seeing these albums when my father was alive and I could ask him about them? Or did he try to share them, and I just wasn’t interested? Weepiness threatened. My mood lightened when I delved into a bag and found two bears that my sister-in-law Lila had crafted for my mother many years ago. The bears stayed on a guestroom bed. Lila made them from quilts my mother’s mother had quilted. I never met my maternal grandmother. She died at age 58 before I was born. The bold colors she chose had survived decades of use, but the quilts themselves had almost disintegrated. Mother recalls that her mother made the quilts from scraps left over from sewing clothes for Mother and her four sisters. I am happy that Lila could salvage this tangible little bit of family history. In the photo my mother’s bears are in the center and on the right. For the photo above, I added two bears of my own that Lila made about the same time she made Mother’s bears. Raw material for the dark one on the left was a quilt my late father-in-law received during World War II. He was from Chicago, and women from Midwestern states had made quilts to give to young men entering military service. Perhaps these bears will be a gateway for regaling my grandchildren with stories of my forebears (arghhh! pun intended). My immediate discovery for the day, however, was that a stuffed bear can be an effective mood-altering substance. My 15 minutes ended with a smile. Valentines Day is the anniversary of two extra special valentines in our family, niece Amanda, 19, and great-niece Trinity, 7, both with Feb. 14 birthdays. 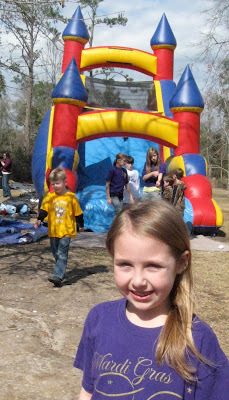 Amanda is the eldest daughter of my brother Mike Carpenter. Trinity’s mom, Melissa Byrd, is married to our nephew Ryan. With their marriage we gained a sixth niece – Melissa, and our only great niece – Trinity. Our nieces for many years gave us our only brush with the world of princesses-in-training. They have been and still are a continual source of joy, pride and education about girl things. Our Skupien nieces also share responsibility for three “great” blessings: great-nephews, Ashton, 5, whose mom is Stephanie, and Miles, 13 months, whose mom is Sandi; and great-niece Trinity. God bless Amanda and Trinity as they begin their new year! Thanks to brother Mike for the photo of Amanda. 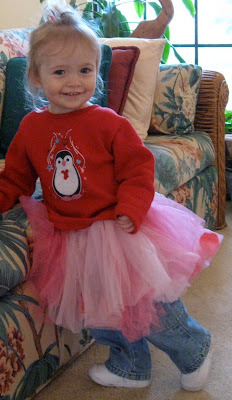 Granddaughter Stella -- Happiness is a pink tutu. Snowflakes soft and sparse, gray gray skies. Thank you, God, for a glorious day. Since weather is still keeping me out of therapeutic grubbing in the dirt, maybe posting veggie pix will help me combat my weather-related grumpiness. 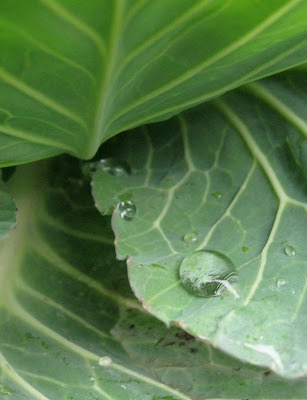 The cabbage, one of two plants residing in a pot in a flowerbed, got off to a slow start; but home-grown cabbage was finally on our menu for supper last night. I have no idea what this salad green is. I never realized it would go to seed so quickly. 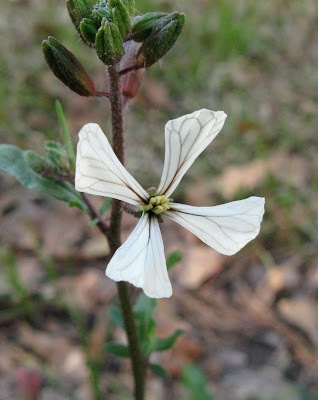 Wikipedia describes mesclun as “a salad mix of assorted small, young salad leaves which originated in Provence, France. The traditional mix includes chervil, arugula, leafy lettuces and endive in equal proportions, but in modern iterations may include an undetermined mix of fresh and available” lettuces and other leafy green vegetables. The tiny patch I planted has supplemented our store-bought Romaine, but I have been negligent about going out and harvesting in rain and cold. - Saints won the Super Bowl! - A visit from grandkids is in the works this weekend! - Retirement frees me to spend the night with my mother this week, be with her through tests and a doctor’s appointment, and have time with her! - My husband’s work schedule gives us wonderful time together! - The list of blessings is longer than what I could post here! 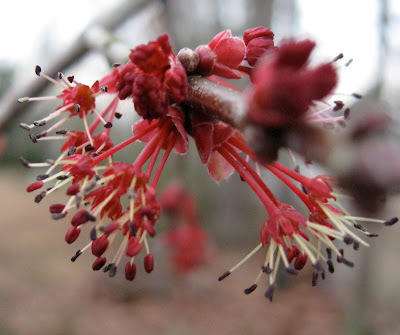 Jan. 31, 2010, marked my fiftieth post since starting to blog in November 2009. As milestones go, it doesn’t seem that significant. But it does nudge me to reflect on just what this blog is and the road I have traveled with it. Although I seem to be mentioning the word “retirement” less, Retirement Daze is fulfilling my original purpose as the posts record external and internal landscapes of my retirement. Thankfully, I put the word “random thoughts” in the description of the blog. I have yet to develop a defined niche, but I have enjoyed the luxury of posting about anything that piques my interest. The technology has been a challenge and is still a source of frustration. The challenge could be character building. Or not. Maybe I am just causing heartburn for those within earshot of my moaning and whining. What I did not anticipate when I started was how much I enjoy being a part of the blogging community. I can sit down with a cup of hot tea, check out a new post by a blogging grandmother near Savannah, GA, and share a chuckle or a tear about the antics of her little ones. Or marvel at images shared by gifted photographers, both pro and amateur, the world over. And the words. I love words, and writers of all ages and walks pour out words in wondrous, wild, funny and unexpected ways. The other thing that surprises me is my obsession with Sitemeter. Sitemeter provides a thrill when I see that someone on the other side of the globe is looking at my blog. And even more of a thrill is recognizing a return visitor. Thank you, thank you, thank you for visiting! I saw this sign when we made a pit stop at a gas station on our back-roads route to Savannah, GA, in November 2009. I had asked husband Walter to take a photo of it. Two things prompted me to post it now. Several days ago he asked me if I had done anything with it. That was the first prompt. Then Sunday as we were coming home from church, there was a Kentucky Fried Chicken sign advertising tailgate specials. That was the second prompt. My train of thought chugged off to Saints-in-the-Super-Bowl tailgating. Then my train took a sharp turn and derailed at that gas station’s sign. Yum?